Former White House press secretary Sean Spicer still plans on leaving the White House in late August, according to a new report. Spicer announced his resignation less than two weeks ago, when President Donald Trump hired former Wall Street executive Anthony Scaramucci as the communications director for the White House. 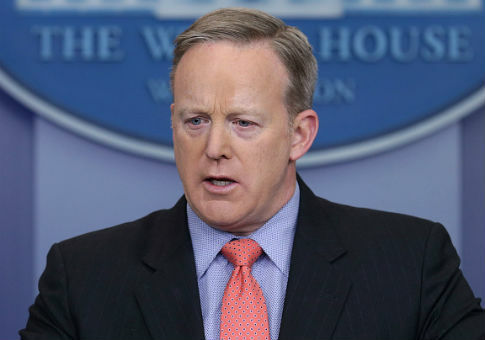 Spicer resigned in protest, and it was reported that Spicer's ally, former White House chief of staff Reince Priebus, was also against Scaramucci being hired. Priebus was replaced by Secretary of Homeland Security John Kelly last Friday, and Scaramucci was removed as communications director on Monday at the request of Kelly. Kelly is now considering veteran government spokesman David Lapan as communications director, according to reports. With Scaramucci out, some speculated whether Spicer would stay on in the White House. A senior White House official on Tuesday told Reuters that Spicer still plans to leave. The official also said that Spicer is receiving "lucrative" offers after he leaves the White House. This entry was posted in Politics and tagged Anthony Scaramucci, John Kelly, Reince Priebus, Sean Spicer, Trump Administration, White House. Bookmark the permalink.